Real estate owners are amplifying the sustainable impact of their properties by embracing both LEED and Parksmart certifications. Parksmart, the world’s only rating system advancing sustainable mobility through smarter parking structure design and operation, expands sustainable mobility opportunities for both tenants and visitors. New LEED Building Design and Construction and existing LEED Operations and Maintenance projects, under both the LEED 2009 and LEED v4 rating systems, can automatically earn credit toward Parksmart recognition. An office tower atop a parking structure or a retail mall containing structured parking can be doubly recognized, earning both certifications and creating ripples that extend far beyond the building itself. Not only is a property’s LEED certification also recognized by Parksmart, but specific credits such as LEED commissioning, construction, life cycle and renewable energy are as well. In fact, a LEED-certified project can already be halfway to achieving Parksmart certification. To assess whether your facility is ready to achieve Parksmart certification, please download our Owner’s Checklist. The recently released Parksmart and LEED Synergies v2 crosswalk streamlines the recognition process between both rating systems and helps parking asset owners leverage LEED certification into achieving both LEED and Parksmart certification. Read more about how garages can benefit from both LEED and Parksmart. 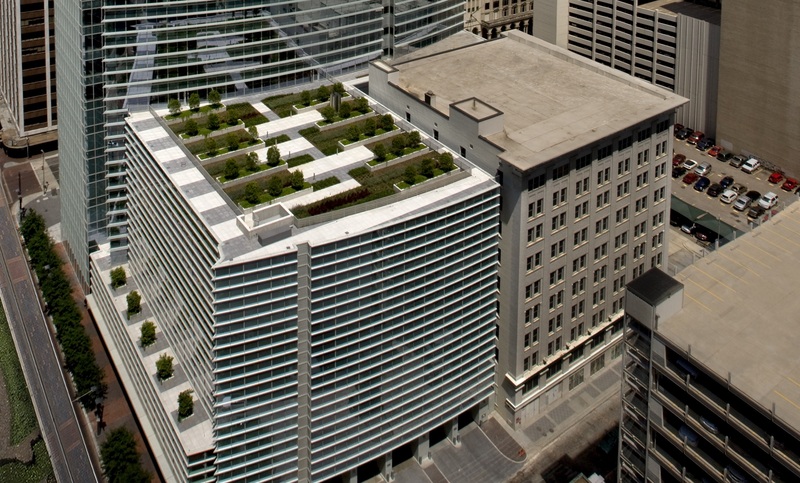 Brookfield’s Bank of America Plaza drew from their LEED certification to achieve Parksmart recognition early on. The 2,128-space garage serves a 55-story office tower in downtown Los Angeles and is a hub for the surrounding community. Sustainability measures implemented at the garage that helped achieve both certifications include energy-efficient lighting and ventilation systems, green cleaning practices, low-emitting vehicle spaces, bicycle parking amenities, electric vehicle fueling stations and access to sustainable transportation options. 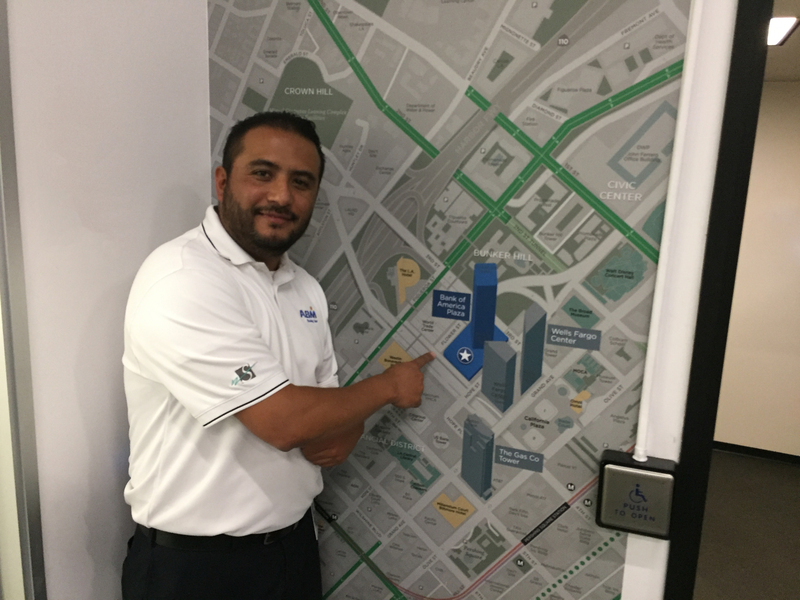 “The Parksmart certification validated all the work/policies we implemented in the garage when the building first achieved LEED status in 2009–2010,” explains Mario Izaguirre, ABM Parking Facility Manager at Bank of America Plaza. “Knowing that the garage holds its own certification makes us all even more proud to be here, and the dual certification helps our marketing efforts and leasing discussions with prospective clients, too." A Hines LEED Platinum property certified under Core and Shell, 811 Main (formerly BG Group Place) is currently recertifying under LEED O+M. The Houston property is wrapped in a glass façade, hosts a vegetative roof, employs efficient lighting and ventilation technologies and a condensate recovery system to reduce the property’s resource consumption, and provides commuters with local and sustainable transportation options. “811 Main was developed adjacent to a new public transportation feature, the Metro Light Rail, with sustainability in mind,” adds Winpark’s Nichole Crossland. “The parking garage’s green roof, condensate recovery system and its lighting controls are key to both the LEED and Parksmart certifications, so it’s wonderful to hear that the overlap is now recognized." Both LEED and Parksmart certifications contributed to the BOMA International Outstanding Building of the Year TOBY Award. Canopy Airport Parking in Commerce City, Colorado, makes sustainability central to its development and construction, and it set out to build the most sustainable parking lot possible. The result was an award-winning carpark that achieved Parksmart Pioneer and LEED Gold certification, was recognized by the International Parking Institute as the most sustainable garage of the year in 2012 and won the National Parking Association’s 2012 Innovation Award for the Innovative Sustainability Project of the Year. Recycled construction materials, commissioning, energy-efficient fixtures and responsible construction waste management were among the strategies employed at this location near the airport. Canopy is 80 percent more efficient than a comparable traditional parking structure, is powered by solar and wind farms and employs geothermal heating and cooling. Parksmart benefits everyone, from building owners and property managers to tenants, visitors and neighbors. Certified parking structures reduce environmental impact, improve energy efficiency and reduce energy consumption. Parksmart structures integrate sustainable mobility services and technologies, diversify mobility options, promote alternative modes of transportation, and reduce operational costs up to 25 percent compared to the national average. If you own or manage a LEED property, or are building one, its parking structure could help your community turn to the corner to more sustainable mobility. Parksmart offers you guidance for and recognition of your thoughtful parking design and management. Reach out to Parksmart via email or call 800.795.1747 to find out how you can get double recognition for your sustainable building work.